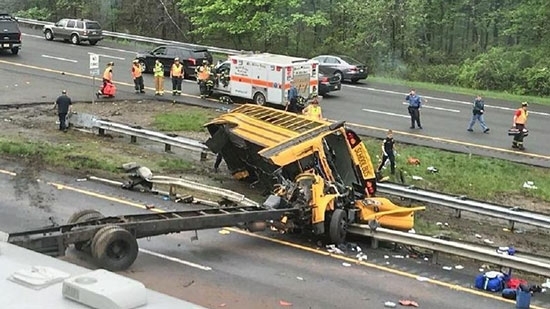 The driver of a school bus that collided with a dump truck on a North Jersey highway last week has been charged. 77-year-old Hudy Muldrow Sr. is charged with death by auto, or vehicular homicide, in the deaths of 10-year-old student Miranda Vargas and 51-year-old teacher Jennifer Williamson. Muldrow was driving a bus full of middle school students with teachers and chaperons on a field trip the morning of May 17th. He missed a turn and merged onto limited access highway I-80. He then turned sharply left and crossed three lanes of traffic in an attempt to reach an official-use U-turn area in the median. That is when the dump truck collided with the bus, sheering the entire cabin from its frame. In addition to the fatalities more than 40 others were injured. Muldrow's driving record has numerous violations and suspensions over the years. At the time of the crash, though, he did have all his valid privileges and licenses. Police in New Castle County, Delaware, are investigating after two people were found shot to death inside a car. Police discovered the two victims early Thursday, 5/24, at the intersection of Kiamensi Road and Rothwell Drive in the area of the Glen Burnie Estates. They have been identified as 30-year-old Isabel Cooper and 34-year-old Thessalonis Berry. No arrests have been made. There is a $10,000 reward for any information that leads to an arrest and conviction in the case. Anyone with information is asked to call police at 302-395-8110 or 302-573-2800. Philadelphia Police have found the remains of a man in Pennypack Park in Northeast Philadelphia. Police were first called to Blakiston Street and Frankford Avenue around 6:30 p.m. on Wednesday, 5/23, about the possibility of a dead body. Cadaver dogs searched and found a badly decomposed body at around 9 p.m. inside the park off of the Welsh Road and Roland Avenue entrance. The medical examiner will have to determine the cause and manner of death. Police are working to identify him.